Alec Guinness de Cuffe was born on 2 April 1914, in Marylebone, London, England, to mother Agnes Cuffe. He was an English actor, probably best known for his roles in films such as “The Bridge on the River Kwai”, “Dr. Zhivago”, “Hitler: The Last Ten Days” and “Star Wars”. He passed away from liver cancer in 2000. A famous actor, how wealthy was Alec Guinness? Sources state that Guinness had established a net worth of over $100 million, acquired during his long career as an actor, and also through sales of his autobiographies. Guinness was raised by his mother in Maida Vale north London – his father’s identity is unknown. He attended a public school at Fettes College, his education being paid by a Scottish banker Andrew Geddes, whom Guinness believed was his father. His mother later married a British soldier, but the marriage didn’t last long. Upon matriculating in 1932, Guinness worked as an apprentice copywriter in a local ad company, but then received a scholarship to the Fay Compton Studio of Dramatic Art, and made his stage debut in 1934 with “Queer Cargo”. He played classic roles at the Old Vic theater from 1936, appearing in various major stage productions such as “Hamlet”, “Thunder Rock”, “Richard II”, “The Merchant of Venice”, “Romeo and Juliet”, “Twelfth Night”, “Henry V”, “The Tempest” and many others, before enlisting in the Royal Navy with the beginning of World War II. During this time, he appeared in the Broadway production of “Flare Path”. As the war ended, Guinness returned to the Old Vic and performed in “The Alchemist”, “King Lear”, “Cyrano de Bergerac” and “Richard II”, and went on to appear in “An Inspector Calls”, “The Cocktail Party”, “Hamlet” and “Richard III”. His performance in “Dylan” earned him a Tony Award. Guinness’ last performance in theater was the 1989 play “A Walk in the Woods”. His numerous stage performances greatly added to his net worth. Guinness made his film debut with David Lean’s 1946 film “Great Expectations”, in which he played Herbert Pocket. In 1948 he took the role of Fagin in Lean’s “Oliver Twist” and the following year he played a total of eight characters, including women, in the film “Kind Hearts and Coronets”. Paving his way to stardom, the actor went on to appear in ’50s films such as “The Lavender Hill Mob”, “The Ladykillers”, “The Swan”, “The Card” and “The Bridge on the River Kwai”, another film by Lean, for which Guinness won a Best Actor Oscar and a Golden Globe. The following year he was nominated for Oscar as a screenwriter for the satirical film “The Horse’s Mouth”. Several other roles followed, and Guinness established himself as a recognized figure in the film industry. His collaboration with Lean continued through the 60s, with his roles as Prince Faisal in “Lawrence of Arabia”, Bolshevik leader General Yevgraf Zhivago in “Doctor Zhivago” and later as Professor Godbole in “A Passage to India”, all acclaimed and adding considerably to his net worth. One of Guinness’ best performances was his title role in the ’70s film “Hitler: The Last Ten Days”. During this time, he also appeared in the television series “Tinker Tailor Soldier Spy” and “Smiley’s People”, roles which brought him two British Academy Television Awards for Best Actor. However, Guinness is perhaps best known at that time for his role as Obi-Wan (Ben) Kenobi in the 1977 film “Star Wars”; the film became a worldwide sensation and a massive success at the box office, with Guinness earned recognition from at least two generations of audience, and also a nomination for Best Supporting Actor. He went on to appear in the film’s equally successful sequels in the early 80s, “The Empire Strikes Back” and “Return of the Jedi”. With his portrayal of the Jedi knight, Guinness’ net worth was significantly boosted. Aside from his acting career, Guinness wrote three volumes of autobiography, the 1985 “Blessings in Disguise”, the 1996 “My Name Escapes Me” and the 1999 “A Positively Final Appearance”. All three books were best-sellers that improved Guinness’ fortune. The actor had won numerous other awards and honors, such as Golden Globe, Oscar, Tony and BAFTA awards. He was knighted by Queen Elizabeth II for his services to arts and received his Hollywood Walk of Fame star. In his private life, Guinness was married to artist, playwright and actress Merula Sylvia Salaman from 1938 until his death from liver cancer in 2000 in West Sussex. Their son is actor Matthew Guinness. TV Shows "Queer Cargo" (1934), "Hamlet", "Thunder Rock", "Richard II", "The Merchant of Venice", "Romeo and Juliet", "Twelfth Night", "Henry V", "The Tempest"
4 Known for playing multiple complex characters and changing his appearance to suit. 1 [One day, director Ronald Neame found Guinness sulking in his dressing room, refusing to come to the set. According to Neame, Guinness felt he had not been stroked enough and explained] Actors are emotionally 14-year olds. We need to be chastised like children, and we need to be hugged and told we're doing fine work. We are the children who never grow up. 2 [on playing Gulley Jimson in The Horse's Mouth (1958)] I try to get inside a character and project him - one of my own private rules of thumb is that I have not got the character until I have mastered exactly how he walks. 3 [on Star Wars: Episode IV - A New Hope (1977)] Can't say I'm enjoying the film. New rubbish dialogue reaches me every other day on wadges of pink paper - and none of it makes my character clear or even bearable. I just think, thankfully, of the lovely bread, which will help me to keep going until next April. 4 I can walk through a crowd and nobody would notice at all. 5 [on winning the Best Actor award for The Bridge on the River Kwai (1957)] No doorstop shenanigans for me. I'll put the Oscar on my mantel, which I realize makes very dull copy, except that I'll put a mirror on the mantel so that I'll get a view of Oscar's back too. 6 [on Star Wars: Episode IV - A New Hope (1977)]: When it came to me in script form, I was in Hollywood on the last day of another movie and I heard it was a script by George Lucas, well that meant something; you know, American Graffiti (1973), this is a new generation, lovely. And then I opened it and saw it was science fiction and groaned, I thought "oh no, they've got the wrong man." I started to read it and I thought some of the dialogue was rather creaky, but I kept turning the pages, I wanted to know what happened next. Then I met George Lucas, fell for him, I thought he was a man of enormous integrity and bright and interesting, and I found myself involved and thank God I did. 7 [Asked if Star Wars: Episode IV - A New Hope (1977) had made him a fortune]: Yes, blessed be Star Wars. But two-thirds of that went to the Inland Revenue and a sizable sum on VAT. No complaints. Let me leave it by saying I can live for the rest of my life in the reasonably modest way I am now used to, that I have no debts and I can afford to refuse work that doesn't appeal to me. 8 [Asked if he was a rich man]: No, not rich. Compared to striking miners and workless actors very rich: compared to successful stockbrokers and businessmen I expect I would be considered nearly poor. 9 An actor is totally vulnerable. His total personality is exposed to critical judgment - his intellect, his bearing, his diction, his whole appearance. In short, his ego. 10 An actor is at his best a kind of unfrocked priest who, for an hour or two, can call on heaven and hell to mesmerize a group of innocents. 11 [his diary entry after viewing Star Wars: Episode IV - A New Hope (1977) for the first time] It's a pretty staggering film as spectacle and technically brilliant. Exciting, very noisy and warmhearted. The battle scenes at the end go on for five minutes too long, I feel, and some of the dialogue is excruciating and much of it is lost in noise, but it remains a vivid experience. 12 [on Laurence Olivier after the death of the only acting peer of the realm] Olivier made me laugh more as an actor [in eccentric comedy parts] more than anyone else. In my case, I love him in comedy and am not always sure about him in tragedy. 13 I am always ashamed of the slowness of my reading. I think it stems from the fact that when I come across dialogue in a novel, I can't resist treating it as the text of a play and acting it out, with significant pauses and all. 14 Flamboyance doesn't suit me. I enjoy being elusive. 15 Essentially I'm a small part actor who's been lucky enough to play leading roles for most of his life. 16 [on The Bridge on the River Kwai (1957)]: The original script was ridiculous, with elephant charges and girls screaming round in the jungle. When David Lean arrived, with a new screenwriter, it became a very different thing. I saw Nicholson as an effective part, without ever really believing in the character. However, it paid off; it was a huge success and I got an Oscar for it, though I don't think it made an enormous difference in my career. 17 The stage was my prime interest. I had no ambition to be a film actor, and a screen career seemed unlikely to come my way. I'd done a stage adaption of "Great Expectations" before the war and this had been seen by David Lean and Ronald Neame. I went into the navy during the war, and when I came out they were preparing their film [Great Expectations (1946)]. They remembered my performance on the stage and asked me if I'd go into their film as Herbert Pocket. I'd thought of film as a much greater mystery than the theater and I felt a need to begin in films with a character I knew something about. 18 [on his first lunch meeting with George Lucas]: I liked him. The conversation was divided culturally by 8,000 miles and 30 years; but I think we might understand each other if I can get past his intensity. 19 [while considering doing Star Wars: Episode IV - A New Hope (1977)]: Science fiction - which gives me pause - but it is to be directed by George Lucas, who did American Graffiti (1973), which makes me think I should. Big part. Fairytale rubbish, but could be interesting. 20 [on the performances in Star Wars: Episode IV - A New Hope (1977)]: The only really disappointing performance was Anthony Daniels as the robot - fidgety and over-elaborately spoken. Not that any of the cast can stand up to the mechanical things around them. 21 [on media reports of his income from the Star Wars films]: The Times reports I've made £4.5 million in the past year. Where do they get such nonsense? 22 [during filming of Star Wars: Episode IV - A New Hope (1977)]: Apart from the money, I regret having embarked on the film. I like them well enough, but it's not an acting job, the dialogue - which is lamentable - keeps being changed and only slightly improved, and I find myself old and out of touch with the young. 23 [To a group of reporters upon winning his Academy Award in 1958]: No doorstop shenanigans for me, boys. I have a nice mantel where I'm going to display it. 24 Personally, I have only one great regret - that I never *dared* enough. If at all. 25 An actor is an interpreter of other men's words, often a soul which wishes to reveal itself to the world but dare not, a craftsman, a bag of tricks, a vanity bag, a cool observer of mankind, a child and at his best a kind of unfrocked priest who, for an hour or two, can call on heaven and hell to mesmerize a group of innocents. 26 Getting to the theater on the early side, usually about seven o'clock, changing into a dressing-gown, applying make-up, having a chat for a few minutes with other actors and then, quite unconsciously, beginning to assume another personality which would stay with me (but mostly tucked inside) until curtain down, was all I required of life. I thought it bliss. 27 Once I've done a film, it's finished. I never look at it again. 28 I don't know what else I could do but pretend to be an actor. 29 I prefer full-length camera shots because the body can act better than the face. 30 I gave my best performances during the war, trying to be an officer and a gentleman. 31 [replying to a writer whose script he rejected, who sent him a note saying "We tailored it just for you"] But no one came to take measurements. 33 We live in an age of apologies. Apologies, false or true, are expected from the descendants of empire builders, slave owners, persecutors of heretics and from men who, in our eyes, just got it all wrong. So with the age of 85 coming up shortly, I want to make an apology. It appears I must apologize for being male, white and European. 34 Failure has a thousand explanations. Success doesn't need one. 35 I shrivel up every time someone mentions Star Wars: Episode IV - A New Hope (1977) to me. 36 [on how much he disliked working on Star Wars: Episode IV - A New Hope (1977) and his attempts to encourage George Lucas to kill off Obi-Wan Kenobi] And he agreed with me. What I didn't tell him was that I just couldn't go on speaking those bloody awful, banal lines. I'd had enough of the mumbo jumbo. 1 Guinness had a 2.25% interest in the revenue from Star Wars, which would be the highest grossing movie at the time (and second only to Gone With the Wind when adjusted for inflation). Guinness had agreed to a 2% interest to make the film, but he reported that just before release during a telephone conversation George Lucas had offered an additional 0.5% because of how supportive and helpful Guinness had been (with dialogue, other actors, etc.). After the release and stunning results at the box office, Guinness asked to confirm the additional 0.5% in writing, but was told it was (reduced to) 0.25%, although it is not clear who had decided this. This was revealed by Guinness in the 1977 interview with BBC's Michael Parkinson on the series Talking Pictures. It was in general supported by many public comments by Mark Hamill, Harrison Ford, and Carrie Fisher all speaking highly of Guinness' professionalism and impact on the set. Apparently Guinness did not quibble- the 1977 worldwide revenue for Star Wars of $400+ million making Guinness' 2.25% probably around $9m for that year alone, with additional revenue well into 1979. In comparison that exceeds other British actor high-water marks for Sean Connery and Roger Moore in the 1970's playing James Bond ($1m salary + $3-5m depending on revenue interests per film e.g. 5-12%). 2 His name is an anagram for "genuine class", a fact which was mentioned in The Simpsons: Lisa's Rival (1994). 3 Although he played Christopher Plummer's father in The Fall of the Roman Empire (1964), he was only fifteen years his senior in real life. 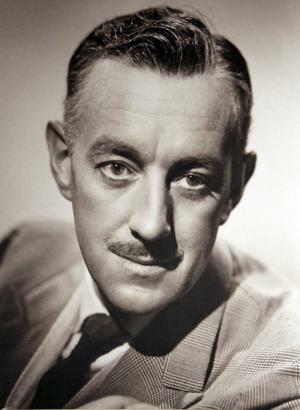 4 The 2003 book "Alec Guinness: The Authorised Biography" reprints several letters that Guinness wrote to his longtime friend and correspondent Anne Kaufman in which he expressed his displeasure with and dubiousness about the quality of Star Wars as it was in production. Before filming started, he wrote: "I have been offered a movie (20th Century Fox) which I may accept, if they come up with proper money. London and North Africa, starting in mid-March. Science fiction--which gives me pause--but is to be directed by Paul [sic] Lucas who did American Graffiti, which makes me feel I should. Big part. Fairy-tale rubbish but could be interesting perhaps. Then after filming started, he wrote to Kaufman again to complain about the dialogue and describe his co-stars: new rubbish dialogue reaches me every other day on wadges of pink paper--and none of it makes my character clear or even bearable. I just think, thankfully, of the lovely bread, which will help me keep going until next April. I must off to studio and work with a dwarf (very sweet--and he has to wash in a bidet) and your fellow countrymen Mark Hamill and Tennyson (that can't be right) Ford. Ellison (?--No!) --well, a rangy, languid young man who is probably intelligent and amusing. But Oh, God, God, they make me feel ninety--and treat me as if I was 106. Oh, [the actor's name is] Harrison Ford--ever heard of him?". 5 Had appeared in two Best Picture Academy Award winners: The Bridge on the River Kwai (1957) and Lawrence of Arabia (1962). Jack Hawkins also appeared in both films. 6 Great-grandfather of Natasha Guinness-Taylor and Otis Guinness-Walker. 7 His experiences with the Royal Navy involved shipping supplies to Yugoslav partisans during World War II. 8 After Guinness won a two year scholarship from a dramatic academy, John Gielgud, one of the competition judges, offered him a role in his production of "Hamlet" in 1934. 9 At a young age, Guinness received acting lessons from Martita Hunt, who dismissed him after two lessons, telling him he would never be an actor although lessons were resumed at a later date. 10 His stepfather fought in the Anglo-Irish War. 11 Though knighted, he did not like being referred to as Sir Alec Guinness. 12 He was awarded a Star on the Hollywood Walk of Fame at 1559 Vine Street in Hollywood, California on February 8, 1960. 13 He preferred working on stage to appearing in films. He also preferred appearing in newer plays rather than the classics, so that his performance would not be compared to how previous actors had played the role. 14 Has appeared in several of David Lean's movies. In them, he has portrayed Englishmen, an Arab, a Russian and an Indian. 15 Was considered by producer Hal B. Wallis for the lead role in Visit to a Small Planet (1960) at the same time with Danny Kaye and Jerry Lewis, the last one eventually getting the role. 16 Upon notification that he was to achieve a lifetime achievement Oscar, he was not keen but expressed thanks. He informed the Academy that there was no way he would even consider flying to California to pick up this award. Academy President Fay Kanin, asked Dustin Hoffman who was doing promotional work from Kramer vs. Kramer in London, to meet with Guinness and persuade him to attend. As both men had very similar attitudes to their past work, Guinness warmed up to the idea and agreed to attend. 17 During his service in the Royal Navy, he commanded a landing craft invading Sicily and Elba, and helped to supply soldiers in Yugoslavia. 18 Favorite actor of both David Lean and Ronald Neame. Had worked on many of both director's films. 19 According to playwright Neil Simon, Alec was reading the script for Star Wars: Episode IV - A New Hope (1977) while on set filming Murder by Death (1976) and commented that Star Wars may be a "good one". 20 While filming The Swan (1956) in Hollywood, he met James Dean, just days before the young actor's death. Sir Alec later recalled predicting that Dean would die in a car crash: when Dean showed Guinness his newly-bought Porsche, Guinness advised him to "Get rid of that car, or you'll be dead in a week!". Guinness unfortunately proved right. 21 Had played the role of Osric in John Gielgud's theatrical production of "Hamlet" in 1934. In Laurence Olivier's 1948 film version, this role was played by Peter Cushing, with whom Guinness appeared years later in Star Wars: Episode IV - A New Hope (1977). The film was also Cushing's first collaboration with future Star Wars cast member Christopher Lee. 22 He was made a Fellow of the British Film Institute in recognition of his outstanding contribution to film culture. 23 Guinness was a member of the Old Vic group organized by John Gielgud in the early 1930s, which also included, among others, Jack Hawkins, Anthony Quayle and Peggy Ashcroft. 24 Contrary to popular rumors, he did not hate working on the Star Wars films. What he hated was the fact that many of the Star Wars fans would only ever remember him as Obi-Wan Kenobi despite all the success of his previous roles. 25 Is the only person to receive a best acting nomination in any of the Star Wars movies. 26 Had his first speaking role on the professional stage in the melodrama "Queer Cargo" (he did not appear in the film). At age 20, the tyro actor played a Chinese coolie in the first act, a French pirate in Act 2 and a British sailor in Act 3, a foreshadowing of the shapeshifting he would do in his cinema career, where he once played as many as eight roles in a single film (Kind Hearts and Coronets (1949)). 27 In the last year of his life, Sir Alec had been receiving hospital treatment for failing eyesight due to glaucoma, and he had been diagnosed with inoperable prostate cancer in January 2000. By the time his liver cancer was discovered in July 2000, it was at an extremely advanced stage, making surgery impossible. 28 Was the subject of a cover story in Time magazine for the week of April 21, 1958, shortly after he won the Best Actor Oscar for The Bridge on the River Kwai (1957). 29 Had played the Fool to Laurence Olivier's first King Lear under the direction of Tyrone Guthrie in 1946 when he was 31 and Olivier was 39. Olivier was generally considered less-than-successful in the part due to his youth and relative lack of maturity in classical parts (though his contemporaneous "Henry V" was a smash and hinted at his future greatness as an interpreter of William Shakespeare). However, Guinness received raves for his acting. Both actors went on to knighthoods and Best Actor Oscars in their long and distinguished careers. 30 Went bald on top, and according to his Time magazine cover story of April 21, 1958, he was embarrassed by it but chose not to wear a hairpiece in private life. He told the Time writer that he had shaved the top of his head as a young man in his first professional acting engagement, playing a coolie. It never grew back properly after that, he lamented. 31 In his autobiographical volumes, Guinness wrote about an incident at the Old Vic when, in the company of National Theater (which originally played at the Old Vic) artistic director Laurence Olivier in the basement of the theater, he asked where a certain tunnel went. Olivier did not really know but confidently decided to take the tunnel as it must come out somewhere nearby, it being part of the Old Vic. In reality, the tunnel went under the Thames, and they were rescued after several hours of fruitless navigation of the dark, damp corridor. Guinness remarked that Olivier's willingness to plunge into the dark and unknown was characteristic of the type of person (and actor) he was. As for himself as an actor, Guinness lamented at times that he did not take enough chances. 32 In certain prints of The Bridge on the River Kwai (1957), a film in which he won the Academy Award for Best Actor, his last name is misspelled "Guiness". 33 Was considered for the role of Hercule Poirot in Murder on the Orient Express (1974), which went to Albert Finney. 34 Celebrated his 62nd birthday during the filming of Star Wars: Episode IV - A New Hope (1977) in Tunisia, where the Tatooine scenes were filmed. 35 Despite being two of Britain's most distinguished actors of their generation, he appeared in only two films with John Mills: Great Expectations (1946) and Tunes of Glory (1960). 36 Had appeared with Kay Walsh in five films: Oliver Twist (1948), Last Holiday (1950), The Horse's Mouth (1958), Tunes of Glory (1960) and Scrooge (1970). 37 Following his death, he was interred at Petersfield Cemetery in Petersfield, Hampshire, England. 38 Both he and his wife, Merula Salaman, converted to the Roman Catholic Church in the 1950s. 39 Won Broadway's 1964 Tony Award as Best Actor (Dramatic) for "Dylan", in which he played the title character, poet Dylan Thomas. 40 Harrison Ford said that Guinness helped him find an apartment to stay at when he arrived in England to film Star Wars: Episode IV - A New Hope (1977). 41 George Lucas said Guinness was very patient and helpful to him during the filming of Star Wars: Episode IV - A New Hope (1977), even to the point of getting the other actors to work more seriously. 42 One of his last jobs was providing the voice (his first and only voice-over) for a cartoon character on a British television ad campaign by the Inland Revenue advising the public about the new tax return forms which were to be introduced. He said in his diary of the recording (made on March 30, 1995) "I did it feebly.". 43 A heavy smoker for most of his life, he finally managed to give up the habit in his last years. 44 His favourite hotel in London was the Connaught, in which he always stayed whenever visiting the city. 45 Reportedly answered one Star Wars fan's boast that he had seen the first movie over a hundred times, with a nod and the words "Promise me you'll never watch it again.". The boy was stunned, but his mother thanked Guinness. 46 Though he often spoke critically of Star Wars, the three leads, Mark Hamill, Harrison Ford and Carrie Fisher, have always spoken very fondly of him, praising him as being a very professional actor who was always respectful to the people he worked with. 47 Ewan McGregor was not the only actor in the Star Wars prequels to study his performances. The voice for the character Watto was modeled after Guinness's performance as Fagin in Oliver Twist (1948). 48 Has been succeeded in two of his roles by actors from Trainspotting (1996). Guinness portrayed Adolf Hitler in Hitler: The Last Ten Days (1973). Robert Carlyle portrayed Adolf Hitler in Hitler: The Rise of Evil (2003), while Ewan McGregor succeeded him in the role of Obi-Wan Kenobi. 49 Biography in: "Who's Who in Comedy" by Ronald L. Smith, pg. 198-199. New York: Facts on File, 1992. ISBN 0816023387. 50 He was awarded the Laurence Olivier Theatre Special Award in 1989 (1988 season) for his outstanding contributions to West End Theatre. 51 Had starred as Eric Birling alongside Sir Ralph Richardson in the first-ever showing of "An Inspector Calls" at the New Theatre in London on October 1, 1946. 52 Was a Grammy nominee in 1964, in the Spoken Word category, for the album "Alec Guinness: A Personal Choice" (RCA Victor Red Seal: 1964), on which he read a selection of his favorite poems. 53 Received an honorary D.Litt degree from Oxford University in 1977 and an honorary D.Litt degree from Cambridge University in 1991. 54 His films were studied by Ewan McGregor in preparation for his role as the young Obi-Wan Kenobi in Star Wars: Episode I - The Phantom Menace (1999) to ensure accuracy in everything from his accent to the pacing of his words. 55 In his last book of memoirs, "A Positively Final Appearance", he expressed a devotion to the television series The Simpsons (1989). 56 His widow, Merula Salaman, died on October 17, 2000, just two months after her husband. 57 He made his final stage appearance at the Comedy Theatre in London on May 30, 1989, in a production called "A Walk in the Woods", where he played a Russian diplomat. 58 The qualities he claimed to most admire in an actor were "simplicity, purity, clarity of line". 59 He was voted third in the Orange Film 2001 survey of greatest British film actors. 60 Despite popular belief, he never uttered the line "May the force be with you" in any of the Star Wars films (the closest he came was "the force will be with you"). 61 He was a huge fan of the television series Due South (1994). 62 He was awarded Knight Bachelor in the 1959 Queen's New Year Honours List for his services to drama. 63 He was awarded the CBE (Commander of the Order of the British Empire) in the 1955 Queen's Birthday Honours List for his services to drama. 64 He was awarded the Companion of Honour in the 1994 Queen's Birthday Honours List for his services to drama. 65 "de Cuffe" is his mother's surname; he never knew the identity of his father (source: obituary, Daily Telegraph, 7 August 2000). 66 He was one of the last surviving members of a great generation of British actors, which included Sir Laurence Olivier, Sir John Gielgud and Sir Ralph Richardson. 67 Father of actor Matthew Guinness and grandfather of Sally Guinness. 68 Reportedly hated working on Star Wars: Episode IV - A New Hope (1977) so much, Guinness claims that Obi-Wan's death was his idea as a means to limit his involvement in the film. Guinness also claims to throw away all Star Wars related fan mail without even opening it. Tunes of Glory 1960 Major Jock Sinclair, D.S.O., M.M. The Steve Allen Plymouth Show 1957 TV Series Himself - Set of "The Bridge on the River Kwai"
1980 Honorary Award Academy Awards, USA For advancing the art of screen acting through a host of memorable and distinguished performances. 1960 Star on the Walk of Fame Walk of Fame Motion Picture On 8 February 1960. At 1559 Vine Street.